David G. had an After Death Communication (ADC) experience which illustrates how the Spirit World communicates with us and the power they have to speak directly to our minds. I take the reader through David’s experiences and relate what the Spirit world is actually doing. Two days later, the day of her Catholic wake, at the evening session, I had a sudden and undeniable verbal communication from Michelle. I was sitting with my wife in the second row at the funeral home before her casket. She said in the voice of a four-year old, “Here comes trouble” and communicated without words that I should go out to the parking lot to meet with a young man who had just arrived. I could clearly see him distraught and teary-eyed with a small group of other young people her age in the parking lot though there was no window in the room. Over and over she wanted me to go out to him and I refused with my rational mind. There were no words at first other than “Here comes trouble” and “Go see him, Uncle Dave”. I just knew I should go and I clearly saw the scene in my mind, the same way I was hearing her words. I sobbed heavily, overcome with a feeling of… awe? emotion? it’s hard to say. I was just hearing her voice so clearly and seeing what was going on in a place I couldn’t physically see. I just ‘knew’ what was happening, and where the boy was. I didn’t know who he was, only that she said “Here comes trouble”. I knew her boyfriend at the time, I had met him at the house. He was in the room in the funeral home with us. This was someone else. I didn’t know who he was, I just knew he was there and that she wanted me to go to him. After I delayed long enough (perhaps a few minutes?) there was no longer a need to go outside. The moment had passed and I felt it. I could see him leaving some of the friends, and moving with others toward the door of the funeral home and eventually into the long hallway crowded with mourners of all ages. It would be a while before he entered the room where I was with my wife and her family. As a part of me followed his slow walk toward the room, I continued the communication with my niece Michelle. She spoke so clearly, in a young voice I best remember. I asked her where she was and why she was talking to me. She told me that she wasn’t speaking to me directly, but that I alone had heard. She said it was a matter of openness to the experience. I asked her why her voice was that of a four year old. 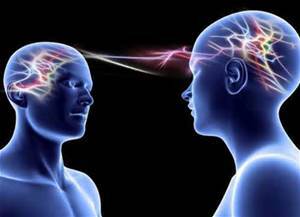 She said there was no actual voice, that she and I were sharing thoughts – thought energies? – and that my mind was putting a voice onto what was being communicated. She deliberately said in her young voice “I could sound like this”, then in her 19 year old voice “Or like this”, then in the voice of a 64 year old woman she would never be “Or like this”. Each time my mind heard the voice clearly and knew what I was hearing. It was indeed my mind putting an audible voice on some other way of communicating. I just ‘knew’ it. It’s so hard to put into words what I was experiencing. This episode perfectly illustrates the communication between the spirit world and the physical world. Spiritism tells us that we all have the capacity to be mediums, to somehow communicate with discarnates (people who are no longer living on the physical plane). But, of course, some of us are better and more adept than others. David G. has that ability, since his niece told him that she was directing her thoughts to everyone in the funeral hall. Spirits talk directly to us, by radiating their thoughts to our Cerebral center, which controls senses, sight, hearing, touch and our psychic abilities. Thoughts are real in the Spiritual world, as in here on earth, they are the beginning of any actions, but more so in Michelle’s new location. By finding a receptor, Michelle could by thought alone, talk to David in whatever voice she so desired. There are two more details I would like to add. The first is that most certainly, Michelle was not alone in the funeral hall; there must have been other spirits there to help her control her thoughts and emotions after such a violent death. Secondly, Michelle must have been an advanced spirit, for most people when they die, go through a, at least, several day period where they are confused or even not aware they have died. 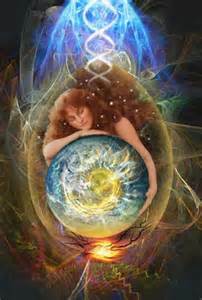 Therefore, for Michelle to have communicated so calmly and with clarity reveals her to be well acquainted with the spirit world and that upon her death, she realized she had accomplished her mission on earth. I asked again, or for the first time, where she was and I saw a blackness, a void, in which there was a spinning orb about ten feet tall to my perception. The spinning orb was the earth and it was spinning very fast – many revolutions per second. Two spiritual forms approached the spinning orb/earth. The spiritual forms I mention were to my perception some sort of misty beings – ghostlike – with some semblance of humanoid scale and size, and yet they were formless. They were human size only in reference to my point of reference, the reference in which the rapidly spinning earth was about ten feet in diameter. As one being said some sort of farewell to the other, the other lifted up in a large puff and disappeared as a funnel shaped mist onto the surface of the planet. In a matter of seconds it reappeared, this time as a small point of a funnel shaped mist lifting up and coming back to the same size and general shape it had before. It walked / drifted away with the first being as they discussed what had happened during that lifetime. I knew I had witnessed a human lifetime from another perspective, a spiritual form experiencing a single human lifetime and then coming back to review it with a friend/peer. It’s hard to explain but it was so clear to me. I believe she also shared the moment of her death during that time we were speaking. She also communicated to me that I shouldn’t share this experience with her immediate family as she came from a troubled family with a horribly abusive childhood. They wouldn’t understand at this time, nor should that abusive energy be part of the equation at that time. I honored her wishes. David G. saw the spiritual world from Michelle’s perspective and he saw her judgment after she died. For a moment he too existed in the other dimension, where time and space is altered, and all exists in a world of vibrations, where our minds control the energy around us. Energy to make us look that way we desire, energy to have us appear to be dressed as we wish. Michelle must have chosen a mission to be part of a dysfunctional family, either to assist the family or to make up for past wrongs or a combination of both. Whatever the facts, even after she passed away she was still trying to protect her family. David G. also let Michelle possess his body at a later time for Michelle could use David to convey to her how much Michelle loved her mother. David G. showed all of the effects of a medium allowing a spirit to use them to communicate to the physical world. I actually dropped down onto the floor in a fetal position weeping. My sister in law asked what was the matter. My wife knew. I lay there trying to get a grip and while I was there in that space between physical reality and soul awareness something happened again. Michelle came through. Not verbally, not in words, but lovingly. She asked if she could use my body. There’s no way to say how these things happen. There’s no real progression of events. It’s just all there all at once. Like that void, that place of nothingness where everything is all the time. Just think about it and you’re there. Any time any place. It’s all one. We’re all one. In Spiritism, David G. would have been trained as to what to expect and how to allow a spirit to temporarily control his body, all the while maintaining the ability to dislodge the spirit when he deemed it necessary. Also, to make sure the situation never spirals out of control, there would be other trained mediums in the room to come to the rescue if the possessed medium felt weak. Again, most probably, Michelle had other souls assisting her in using David G.’s body to convey her message of love. David G. proved himself most useful. Therefore, given his great talent to help others in need, he started upon a new career. I’ve developed a healing arts practice of my own that became a vocation. Since retiring from my career as a postmaster, and even in the years before retiring, I’ve turned that vocation into a small business. I practice as a vocation though, not as a business. It’s not about money. The money comes all by itself when it’s needed. I’ve never had to worry. Working with people, usually with spiritual and emotional blockages, had been my calling. PTSD (post traumatic stress disorder) seems to be a common thread among my best clients. Notice how David G. said, “It’s not about money”, this is one of the most basic rules of Spiritism, you should not charge money for the gifts that God gives to you; you should freely give to others to help them in their time of need. Knowing this, the spirit world provides for those that contribute their talents freely. David G. is not correct when he says, “The money comes all by itself when it’s needed.” There is a team of spirits directing events to ensure that his needs and the needs of his family are taken care of. To understand how your individual fate is determined, tracked, and evaluated please read my book, Explore Your Destiny – Since Your Life’s Path is (mostly) Predetermined. We are so much closer to the hand of God than any of us could ever believe. We grow up in a society where God is at best distant to most of us. Thankfully, I have found out, late in life, as David G. has, that God’s love is so much closer than we realize. I have this and other expanded NDE stories in my book, What Really Happens During Near Death Experiences – According to Spiritism, and if you are interested in Spiritism and how reincarnation is the process for us to improve ourselves over many lifetimes, I have the book, The Case for Reincarnation – Your Path to Perfection, available on Amazon. It’s unfortunate how this event is portrayed. In the act of death or trauma a piece of our soul runs away, leaving this “void” David speaks of. This void is then a sitting duck for any entity to fill it, once an entity has attached itself to one of our holes it can assume the role of that particular trauma, and invoke thoughts into our head. David has an amazing gift for being so sensitive, but he must be careful. For distinguishes must be made between true afterlife and entity, David should never allow this entity to take control of him EVER especially with permission. Welcome to shamanism, or as western society likes to call it “schizophrenia”. Who is David G and could he be contacted for a consultation? David G’s story is on the NDERF.org site. I have a link to it in the footnotes. NDERF doesn’t have an automatic method to directly contact the people writing their accounts of their NDE’s. You can contact NDERF directly and see if they will supply you with that information. People have the right to remain anonymous if they wish on the site, which I am sure we would agree with that premise.